I made this card for my sister-in-law. She is one of the most kind and loving mothers that I know. The card is also part of SSS Flickr Challenge #18. The flower images are from Simon Says Stamp’s Artful Flowers stamp set. I stamped the flowers (there are 3 flowers in this set) onto some blush pink cardstock using Versamark ink. I then applied gold embossing powder to them. I heat embossed the flowers first and then used the coordinating die set to cut out the flowers. One of the dies from the Die-namics Stitched Basic Edges set from My Favorite Things was used to cut a stitched piece on which the flowers were mounted with dimensional foam tape. The bottom piece of the card front is a patterned cardstock from My Mind’s Eye Fancy That collection. The sentiment was stamped in Versamark Ink onto vellum and then heat embossed with the same gold embossing powder that was used for the flowers. The sentiment is from Papertrey Ink’s Keep It Simple: Mother Mini Stamp Set (love the different fonts for Mothers’ Day greetings in this set). Please note that the blush cardstock that I refer to is Stampin’ Up’s cardstock in Blush Blossom. This color is no longer available. I was holding onto this cardstock because it is such a beautiful, delicate shade. It just happened to go well with the Mind’s Eye Fancy That patterned papers that came in my SSS May card kit. What luck! I used the gold-dotted pattern paper from this collection. I hope you like this card as much as I enjoyed making it! Stamps: Simon Says Stamp: Artful Flower stamp set; Papertrey Ink’s: Keep It Simple: Mother Mini Stamp Set. Cardstock: Stampin’ Up: Blush Blossom cardstock (discontinued); My Mind’s Eye: Fancy That 6×6 paper collection (part of SSS May card kit); Bazzill 40 lb. vellum; Neenah Solar White 110# cardstock for the card base. Dies: Simon Says Stamp: Designer Flowers Wafer Thin Dies Set; My Favorite Things: Die-namics Stitched Basic Edges. 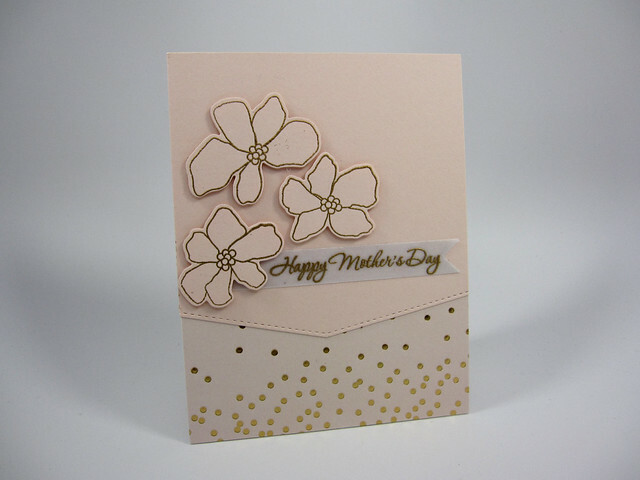 This entry was posted in Challenges, Occasions and tagged Mother's Day, Papertrey Ink, Simon Says Stamp. Bookmark the permalink.